The second series of Big Finish’s The Fourth Doctor Adventures reunites Tom Baker with Mary Tamm’s first incarnation of Romana with tales set during the televised quest for the six segments of the Key to Time. Romana was one of the first companions to come along and truly challenge the Doctor’s way of thinking, and the air of arrogance and pretentiousness she displayed was perfectly fitting of a Time Lady and the perfect starting characterization for someone about to truly experience the universe for the first time. Of course, the excitement of these releases is tempered by the recent passing of Mary Tamm, but ‘The Auntie Matter’ suggests that this series will be a fitting tribute and testament to Tamm as both a person and an actress. With K-9 off in the TARDIS to lead the pursuing Black Guardian astray, the Doctor and Romana have the chance to enjoy a brief respite as the Lord and Lady of a 1920s English townhouse. As Romana enters- by her standards- primitive and uninspiring Earth to learn about quantum theory, the Doctor manages to detect an odd signal on his alien tracking device. Recruiting the maid, Mabel Dobbs, to tag along with him in Romana’s place, the Doctor and his unlikely companion begin a quest of their own. Romana, meanwhile, becomes the object of affection for Reginald, a man who intends to propose marriage in order to appease his aging aunt. As the light-hearted and absurd series of events unfolds, often bringing the Doctor and Romana tantalizingly close to meeting up with each other as they both pursue the same alien signal from different directions, it is perhaps unsurprising that the titular auntie matter refers to a much darker secret of Julia McKenzie’s aunt character. There are, of course, some suitably dark and serious moments to balance the overall sense of whimsy, and the heartbreaking consequences for Reginald will certainly leave a lasting impact. 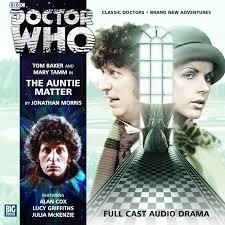 However, ‘The Auntie Matter’ could be described as Doctor Who’s take on a P.G. Wodehouse novel and the exaggeratedly ostentatious dialogue and overall whimsy will undoubtedly cater more to some than to others. As it is, the overall story is drenched in atmosphere and character, and it quickly gets to the point of the aunt forcing her mind into the bodies of potential suitors for her nephew as science fiction and traditional English stereotypes collide wonderfully. Although the ensuing romance between Reginald and Mabel may be a bit too convenient, it does nicely tie off the parallel strands of the Doctor and Romana while allowing fascinating insight into the cursed Valjax race and Florence’s attempts to prolong her life. ‘The Auntie Matter’ boldly takes The Fourth Doctor Adventures into unexpected and novel territory, exactly what was needed after the nostalgia-laced first run. Although the Doctor and Romana spend a substantial portion of the tale separated, it’s great to hear Baker and Tamm together once more as both recapture the essence of their earlier selves effortlessly. While comedy is always a subjective element, ‘The Auntie Matter’ superbly incorporates it to flesh out an already engaging and exciting tale, resulting in a very strong opening story that showcases the immense variability in themes and tones possible within Doctor Who.